Darjeeling is a small hilly town in the Indian state of West Bengal. At an elevation of 6700 feet its location in the lesser Himalayas makes it an attractive tourist destination during the summers. It boasts of clear views of five famous peaks of the Kanchenjunga mountain range and the famous Darjeeling tea, which is one of the most famous black tea in the world. I wanted to see the other side of the town, when there are lesser numbers of tourists and have a different perspective of the place as a whole. So, I booked my tickets and landed in Bagdogra airport in July which is peak monsoon season on the hills. 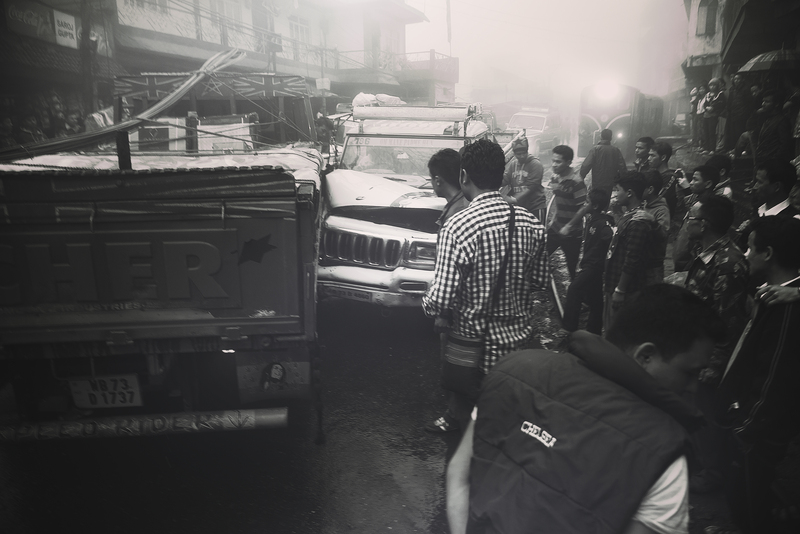 Amidst landslides and red alerts for flash floods I took a car and headed to Darjeeling. Within half an hour of my journey the I was on cloud covered winding roads and a fear of the unknown. “Darjeeling usually does not experience landslides as much, but this year is different” explained the driver, “This year, due to the Bhutan earthquake, the land has loosened up because of aftershocks, thus causing the lose mud to cause massive landslides blocking roads and highways”. 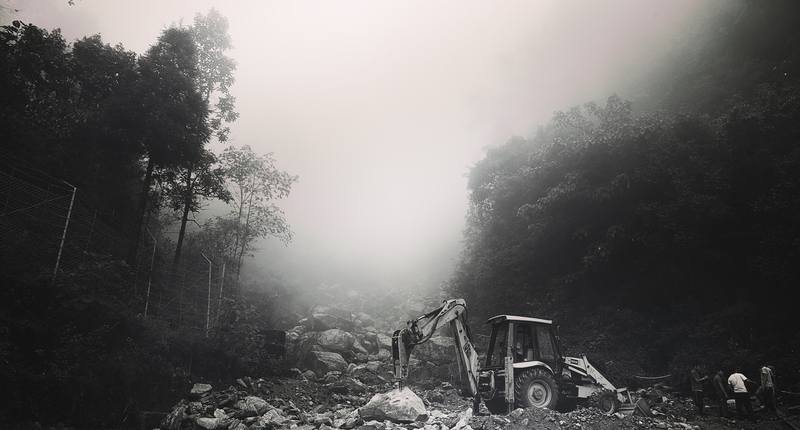 Just the day before there was a massive fatality and 36 people died from different landslides in different areas. Soon, we were surrounded by clouds and visibility was restricted to a few meters. The car kept climbing at a steady pace and we were brought to a halt near Sonada, another sleepy hill town, where there was an accident due to visibility issues. The local people were prompt to jump in and help the two cars that collided and luckily, no one was injured. 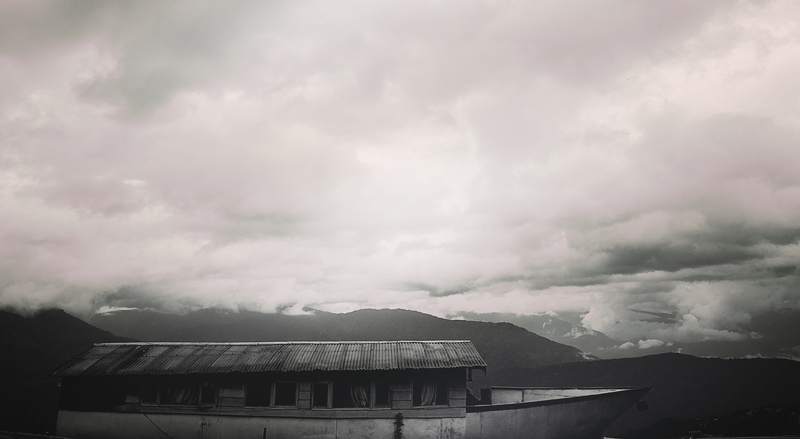 We moved on, without incident to Darjeeling. It was calm, quiet and peaceful. Very few tourist cars, very few ‘pahari’ people going about their daily chores and almost no tourists at all. The weather was cold and I was craving for some hot Darjeeling tea. I headed out into the nothingness and on to the winding roads and found a local tea shop. The hot tea was heavenly. As I took to the streets the old archaic buildings built during the British period stuck out like a sore thumb among the modern buildings and hotels and shopping malls built in the now popular tourist destination. 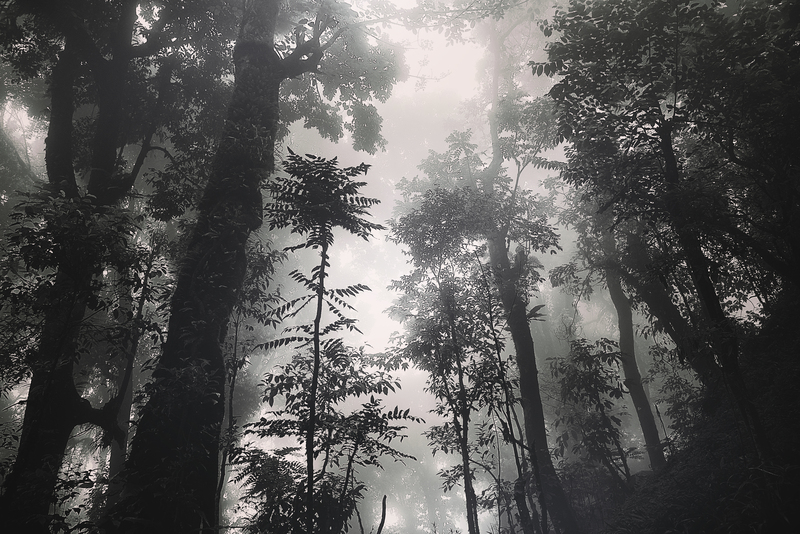 The hill station had come into being in the late 1800s when under the British Raj. It was seen as a suitable summertime escape for the Brits and this led to the construction of a sanatorium and a military depot. 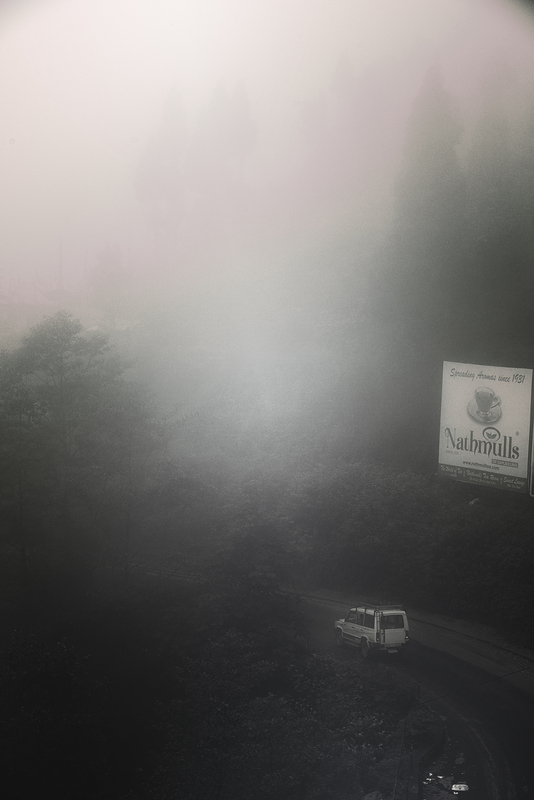 Darjeeling as a tourist spot had been established. But this also caused increase in traffic and the simple cart road was not enough. Franklin Prestage, an agent of Eastern Bengal Railway Company proposed a railway line connecting the popular tea haven to Siliguri, which had a broad guage train service connecting it to Calcutta Harbours. He proposed a steam tramway, along the lines of the cart road and finally after due consideration in 1879 the proposal was accepted by the government. 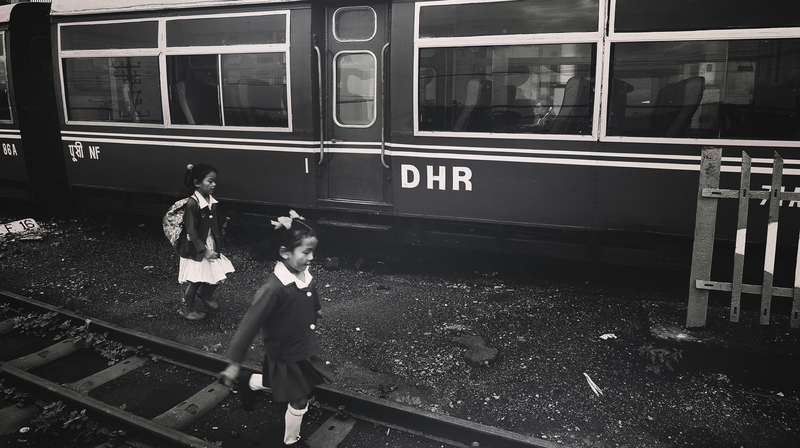 On 4 July, 1881 the train line was inaugurated and the railway company was named Darjeeling Himalayan Railway Company which still remains the same. 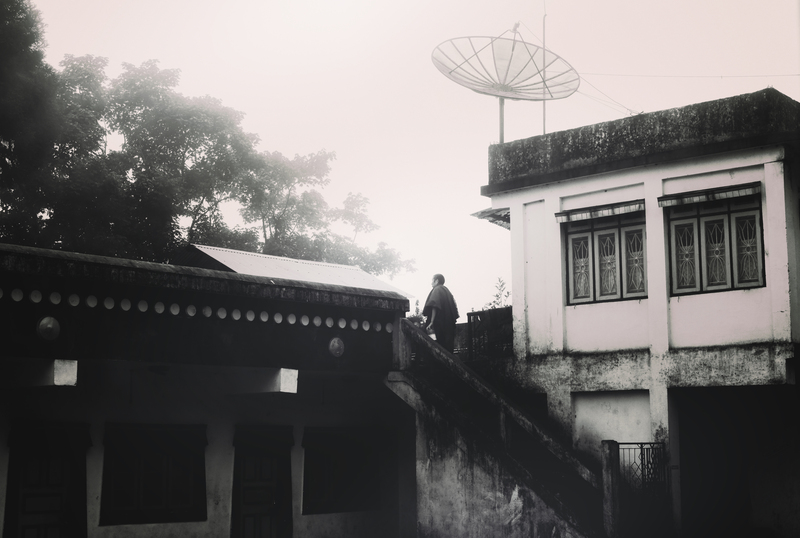 As the British Raj ended, the old buildings and heritage structures of their memories stayed. A few heritage churches, mock tudor buildings, hostels, the train stations and post office are what remains from that era. I decided to go to a local shopping district in the northern part of the city to get a feel of the local people. The open air shopping district is extremely photogenic and a must go for photographers. During summers, the hills and mountain ranges are visible from the Mall area as it is situated in a high ground and has a good viewpoint as well. 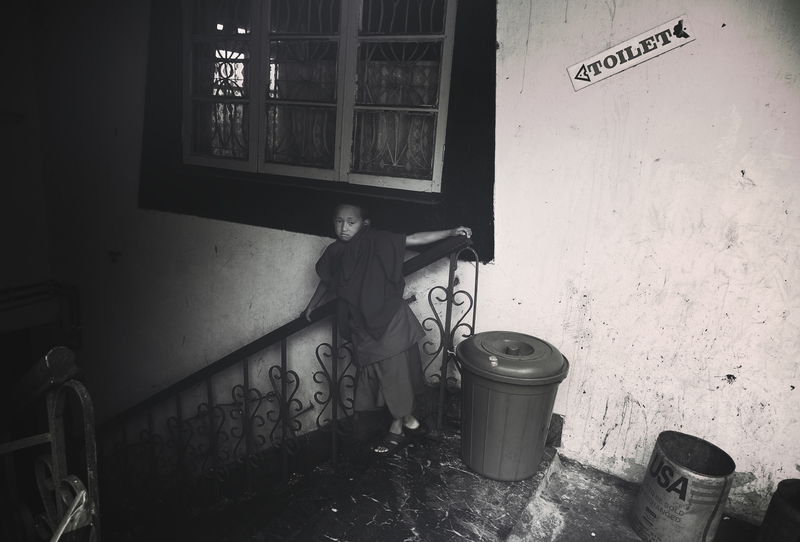 I explored a considerable part of the city on foot as I wanted to get an idea of the place and its different viewpoints which later helped me to shoot. A recce of the place is always advisable if you have considerable time in your tour and since the weather kept changing every half an hour I knew exactly where to go and when to go to get a good view of the cloudscapes. It is important for a photographer to always be aware of their surroundings and measure and calculate the pros and cons. Since my first destination was supposed to be a monastery it was actually better for me to reach there early in the morning. 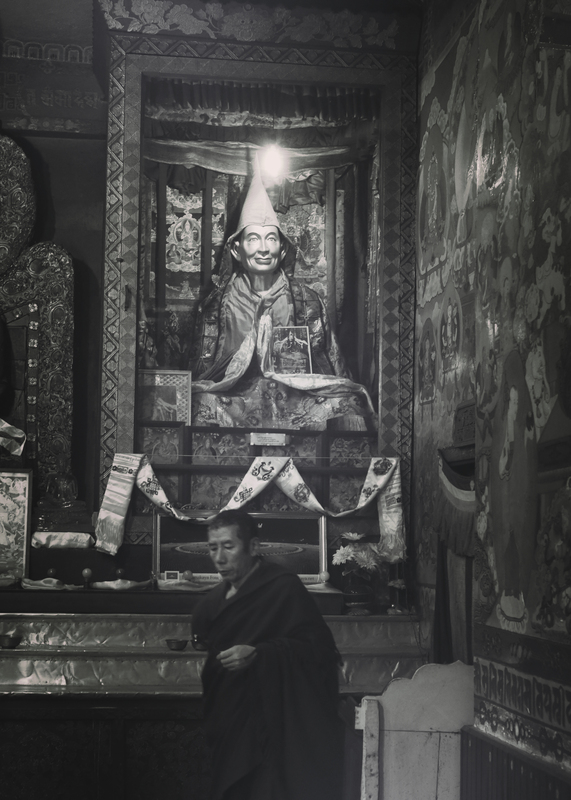 Ghoom Monastery or the Samten Choling Buddhist Monastery was built in 1875 by Lama Sherab Gyatso and is the largest of the three monasteries in Ghum. As I reached the monastery and climbed the 30 odd steps down the hill, I was disappointed to see it closed. I was too early and I was not going to let it go. After waiting for almost half an hour a monk came and opened the doors. The monastery was quiet, surrounded by clouds and mysteriously beautiful. 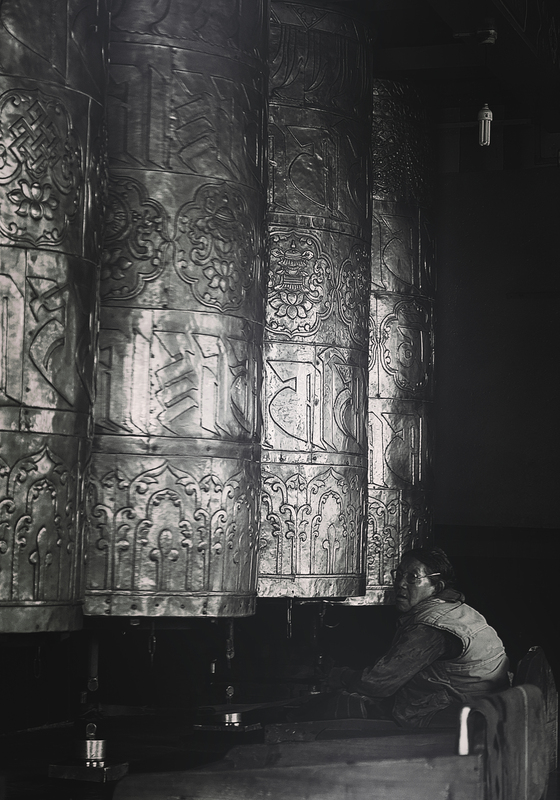 A Tibetan chant started playing from a recorder inside the monastery. The environment was engulfing and peaceful. This is what I wanted! No busy tourists taking selfies, no distractions. It was just me and the monastery but I still had only seen one monk. I wanted some activity for my photographs to look better. After another half an hour wait little children in Maroon Buddhist robes showed up. Some thirty odd monks of varying ages went into a hall. I followed and ended up into their eating hall; they had prepared breakfast and were just starting to eat. A visual treat for any photographer, I grabbed the chance and shot extensively. Going in the off season helped as there was no one else around and the monks felt quite okay with my intrusion. I was playing hide and seek with the unpredictable weather. For a photographer, waiting for the perfect time and perfect weather is more important and time consuming than shooting. 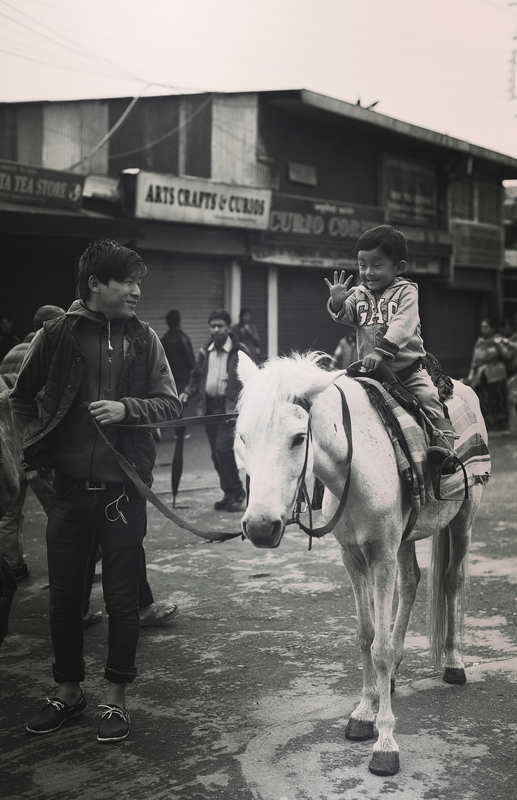 I waited for hours at a time outside Darjeeling railway station on the tracks for the perfect time to shoot. Monsoons had taken their toll and the Toy trains were not operating, which was sad as they are an integral part of covering Darjeeling. Two famous food joints to visit in Darjeeling are Glenary’s and Keventer’s. Glenary’s is a three story building in the heart of the shopping district with huge windows, live music and a bar. It has assorted muffins, cookies, chocolates and patties. It also serves Darjeeling tea which is a must have. The ambience was nice and warm and the shop has a British styled telephone booth as a decoration as well. 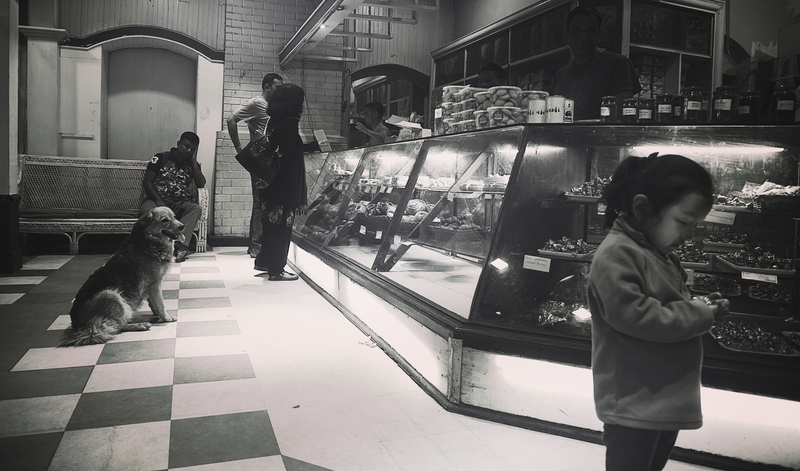 Keventer’s is in the same lane as Glenary’s and is one of the best food joints in Darjeeling. The second floor has a open air seating as well as an indoor seating which has clear views of nearby hills in the summer. Keventer’s is famous for its pork and ham assortments. Undoubtedly Darjeeling is the queen of hills in the eastern part of India and the peak seasons, that is March/April or September to November is the best time to go if you are looking for a happening hill station with a clear sky, breathtaking views and amazing food. But the monsoons have a very different melancholy, mysterious and sublime feel to it. Even though I missed out on most of the usual things seen by every tourist like the Kanchenjunga, Toy Trains in action, tea picking in the plantations etc I did not feel unwelcome to the place. The lack of regular tourist spots and sights gave me a perspective to look within the city – its culture, its heritage, its history and its people. 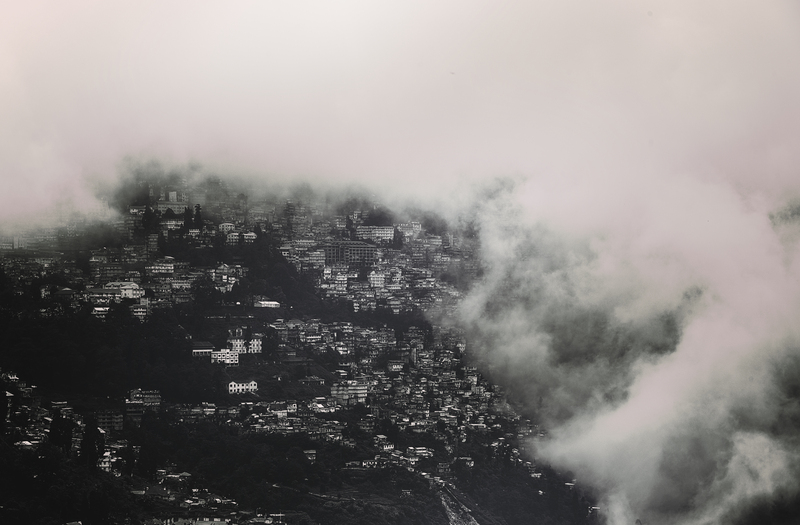 Monsoons bare the naked Darjeeling in all its glory, the real people- the real city. The more I felt it because I have visited recently around the monsoon time and similarly experienced.